A sprawling 17,000 square foot residence originally designed by architect Jeremiah Eck in 2004, one of the Northeast’s most distinguished architects, is back on the market following a significant remodel by Catalano Architects. The property was previously home to the Cabot Estate, owned by Thomas and Virginia Cabot from the late 1920’s until 1997. The new owners constructed a magnificent Jeremiah Eck designed California Lodge style residence on the 12.7 acre property over a period of 6 years, completing in 2004. An article dated February 15, 2013 on Americaninno reveals that architect Jeremiah Eck retained the front facade of the original Cabot house, with everything else demolished including the original foundation. 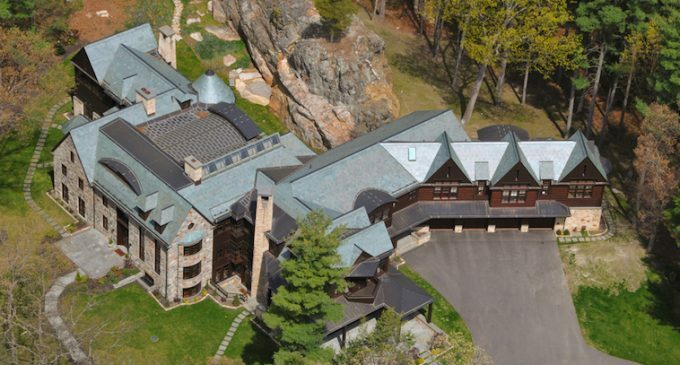 The result was a show-stopping custom home with more than 17,000 square feet of space and highlights such as a grand mahogany gallery with a 28 foot barrel vault ceiling, an underground tunnel leading to a sports and recreation complex, a synthetic hockey room and a swimming pool with cabana and kitchen. The property originally hit the market in 2009 for $24,500,000 before dropping as low as $18,750,000 in September of 2011. It was reduced several more times between 2012 and 2013 before selling in October of 2013 for $10,000,000. The new owners hired Catalano Architects to remodel the already magnificent home, with Boston Magazine describing one aspect of the remodel as, “A misunderstood entry hall becomes a warm, welcoming foyer.” Catalano Architects spent three years updating and refinishing the property, modernizing many of the original rooms. The house offers 17,446 square feet on the first two levels and also includes a finished lower level with recreation space and a theater. There are seven bedrooms, fourteen bathrooms, a modern kitchen and a tennis court that converts into a refrigerated ice rink in the winter months. The property is currently on the market for $18,900,000 with LandVest. Do you prefer the original design by Jeremiah Eck or the updated design by Catalano Architects? Original design by Jeremiah Eck of Eck | MacNeely Architects inc.